For best results,select full screen and scroll the stereo pair to the top of the screen. Place a pen, pencil, or finger tip near the screen at the center mark below the stereo pair. Look at the tip of the pen while slowly bringing it toward your nose as you continue to look at the tip. As you move the pen, observe the images on the screen. You should be getting a double image and the two center images should overlap to form a single 3-D image between two other images by the time the pen reaches 2/3 to 3/4 the distance to your nose. If you are successful, you will get something like the images below and the center square will be in 3-D. (This example will not be in 3-D unless you are still crossing your eyes.) If you see a good match of the image square, but the objects don't line up well, you may need to tilt you head very slightly to one side or the other to get the image to register perfectly. Click HERE for another example of a "cross-eyed" stereo pair. Here is a 3-D graphic. The 3-D effect is so exagerated that it may be a little difficult to see clearly. It is better viewed from a greater distance. If this has aroused your curiosity about stereo photography, look at the links I have placed here. If you were unable to see the 3-D view try the other two pairs that have now been added or try the first link listed. It has a set of graphic 3-D images that may help you practice. Now I've decided to provide the stereo pair with a reverse image to be viewed with a mirror. (I explain later about the mirror technique.) I tried this and was actually surprised by the ease of viewing! I used a ladies handheld mirror that had a long horizontal oval shape. The narrow end of the oval fit right against the bridge of my glasses (just to the left of the bridge) and I viewed the screen from a normal viewing distance. The plane of the mirror will be pointing toward the space between the images and you should be in front of image on the right. It was surprisingly easy to adjust the mirror to get the images to overlap and the 3-D effect was great! However, since the mirror didn't reach all the way to the screen, a little bit of left of the image was not reflected. I also noticed some glare around the little ballerina that seems to be from the front surface reflection. Now I have swapped the images left for right so that they can be viewed in 3-D by the 'straight' view technique. From a viewing position not too close to the screen, try to have a distant (blank) stare in which you are looking far beyond the screen. You should see the images overlap and produce a 3-D image in the center. This is similar to viewing those odd graphic pictures that have a hidden 3-D in them. I find this technique VERY difficult, but others seem to have no problem using it. It is easier for beginners when the images are smaller. I may try that. I was able to view these pretty easily and the 3-D effect is dramatic. The photo pair was made with a 35mm SLR camera mounted on a tripod with a special tripod mounting bracket for stereo photography. A friend at work had given me the homemade bracket. It allowed the camera to be moved horizontally in a controlled manner between shoots. Stereo pairs can be made handheld if care is exercised and if cropping of the resulting photos can be done, but this bracket made it much easier. A tripod-mounted flash was located above and to the right of the camera. The light source should not be moved between shots. I made this pair to try the bracket and to have a nice color stereo pair for the antique stereoscope I got for Christmas one year. I scanned these images and moved the 'right eye' image to the left for 'cross-eyed' viewing. With cross-eyed viewing the right eye, of course, is looking across at the image on the left and the left eye is looking to the right. I was completely fascinated with the ViewMaster my sister and I received from our Uncle and Aunt. I really enjoyed the reel that showed the story of Christmas. The pictures showed little doll characters depicting Mary and Joseph, the animals, and all the others in the story. 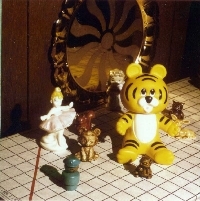 They were photographed on miniature tabletop scenes. In my teen years my Uncle gave me his old 626 roll film stereo camera with a stereo slide viewer. I used some color and some B&W transparency film in it. The pairs were cut from the film and slipped into cardboard slide holders for viewing in the viewer. In the late 1950s, Life magazine had an article on 3-D images and a stereo pair was printed for viewing with the aid of a mirror. One of the pair was printed as a mirror image and by placing the edge of a small mirror along the line between the images it was easy for one eye to view one image in the mirror while the other eye viewed the other image directly. This made it easy to overlap the images and see the 3-D effect. 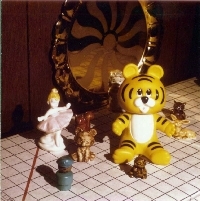 Many years later I built a viewer for 5x7 inch prints using the reversed image/mirror technique. 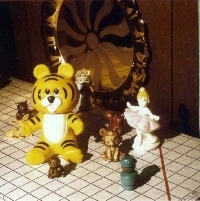 A 'front-surface' mirror works much better for this than regular mirrors because a regular mirror produce a faint reflection from its front surface and when looked at from an angel the front-surface reflection is offset from the mirrored surface reflection and is a distracting fringe image. My uncle also had a mirror attachment for a camera lens and a matching slide viewer for exposing a stereo pair on one 35mm frame. The attachment was sort of like a double periscope. One view was displaced a little to the left and one to the right. Mirrors reflected the images toward the center and into the lens. The slide viewer did the reverse. It used mirrors to separate the images so that they could be viewed at the normal inter-ocular distance. Stereo Photography This site seems to have the best stereo pairs for 'cross-eyed' viewing. The selection is very good also. 3-D Photography This site is the most comprehensive site that I found during my search. Stereo Photography Page This site has a humorous take on stereo photography. Great writing! And I finally noticed the 'animated gif' 3-D image at the top of the page, but it doesn't have a 3-D look to me. Slidebar Stereo Photography This site displays some great stereo pairs for cross-eyed viewing. (Since I've looked more closely, I think some are displayed for straight viewing.) The slidebar is what I used for the pair on my page. You should be good at cross-eyed viewing before trying these, because they are displayed at full screen width.